Last Tuesday was Pancake Day otherwise known as Shrove Tuesday when we are supposed to eat pancakes in preparation for the Lent fast. Whether you observe such traditions or not, any excuse to eat pancakes of any variety is always welcome. I learned to make pancakes from my grandmother and my Mum - scotch pancakes and potato scones always seemed to be made at the same time and leftovers fried up for breakfast with egg and bacon. There is something really delicious about the sweetness of the pancake with the saltiness of the bacon. After making pancakes this year, I received a request for the recipe so here it is. My grandmother worked in spoonsful, pinches and handsful - some of her recipes don't even have that amount of detail but I have worked out the recipe in grams for the modern cook. She used a griddle on the stove but I recently acquired a fantastic crepe pan with non stick surface and thermostatic control from Lidl which takes the guess work out of getting the temperature just right. Sieve the dry ingredients into a bowl. 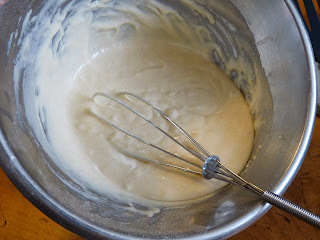 Whisk the egg and milk together in a jug and add the butter and golden syrup. Make a well in the centre of the dry ingredients and add the liquid gradually, stirring in the flour until you have a thick batter. 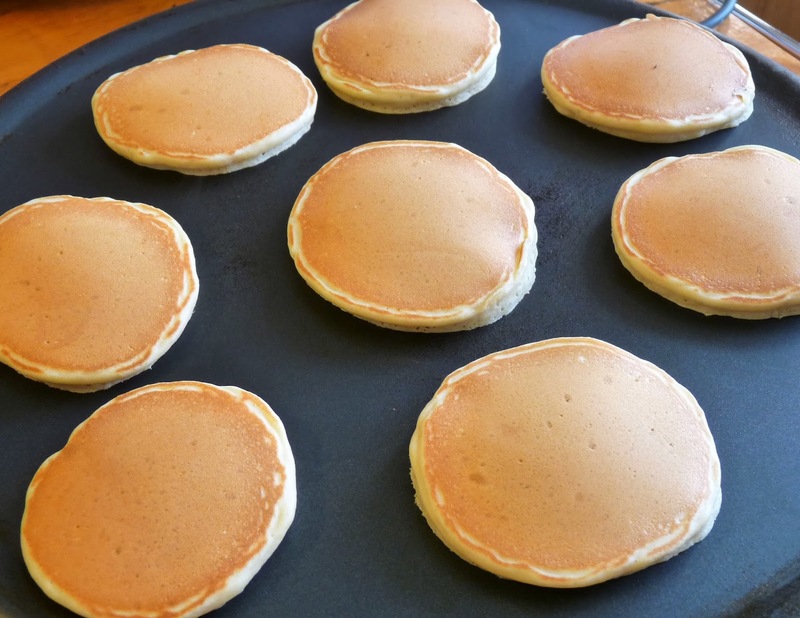 Heat a griddle, thick bottomed or electric frying pan, or an electric crepe maker. Oil the surface lightly and drop spoonsful from the point of the spoon onto the hot surface. Do a test pancake first to check the temperature. If it is correct, the pancakes should cook in about one and a half minutes per side. 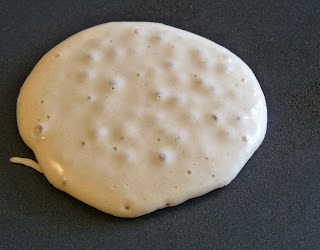 The pancake is ready for turning when the bubbles rise to the surface and start to burst. Flip it over and cook the second side for the same time. 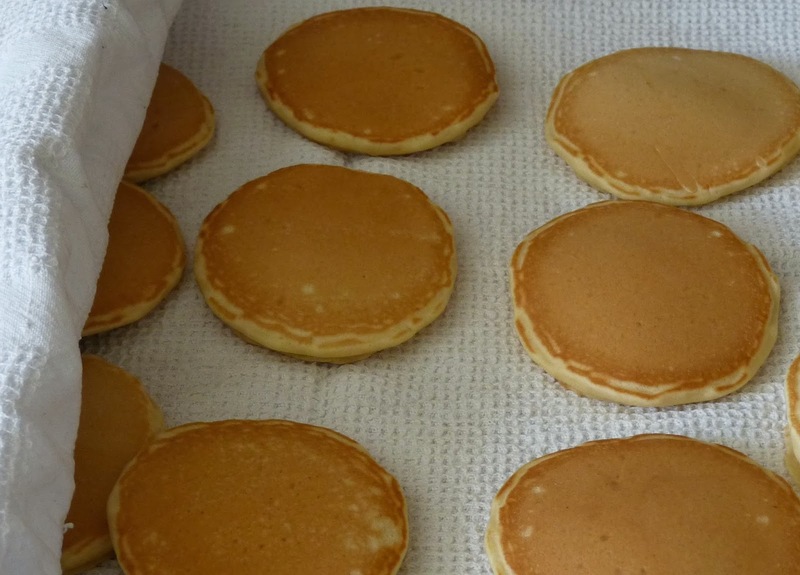 Cool the pancakes on a cooling tray with a clean tea towel above and below. 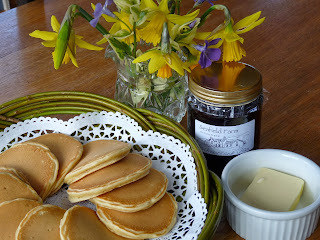 Serve with butter and homemade jam, golden syrup, honey or whatever you like. Enjoy.